Thanks to GlowBall for the tools used to make this theme! 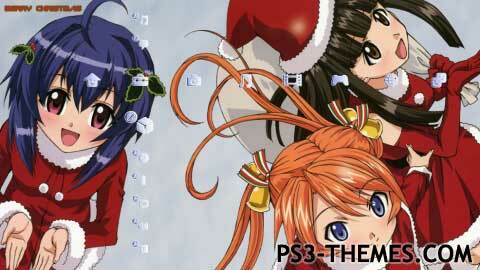 This theme was posted by PS3 Themes on December 12, 2012 at 2:48 pm, and is filed under Comics/Anime, Dynamic Themes, Holiday/Seasonal.You can leave a response or trackback from your own site. I love this theme! Crystal clear and holiday related, thank you so much. nice. i like what you have done with this. I don’t care for loli’s, but you did a good job +1. @SSJTMNT: Thank you and glad you liked it 😀 I will try to work on more Dynamic themes in the future. Also I made a version 2 for the TMNT Classic theme. I found some nice backgrounds so I replaced two that looked low res with two new ones. @TheLoneWolf989: Right now I’m working on a few requests. I will try to bring them out before Christmas since I will be away for a while. Geat job bro i love it who are the animes used?